Acanthus — An herbaceous plant whose stylized leaves have been a common ornamental motif in eastern European decorative arts. Ajoure — Areas of silver in which the background or designs have been entirely cut out of the metal, creating openwork decoration. Also called “pierced” work. Alloy — A substance composed of two or more metals intimately united, usually intermixed when molten. Alpacca — German silver or nickel silver, synonymous trade names; an alloy of copper, nickel and zinc. Annealing — Reheating silver to keep it malleable while it is being worked. Antimony — A natural metal; a brittle, lustrous, white metallic element used chiefly in alloys such as Britannia Metal. Apocryphal — Classical term for a fake piece. Armorial(s) — Coat(s) of Arms engraved on the vessel. The direction of the line or pattern of the engraving indicates the color in the original Arms. Assayer — The person who determines and verifies the amount of gold or silver in an alloyed vessel. All Russian drinking vessels normally have an assay mark stamped on them in addition to other required marks. Assay Mark — The mark stamped into the vessel indicating the assay test was performed and approved. Baluster — A shape (e.g., of old measures) in which the curved outline broadens above the foot and narrows towards the neck. Base Metal — An alloy or metal of comparatively low value to which a coating or plating is normally applied. Biedermeier — A style fashionable c. 1820-1850 in Austria and Germany. Bismuth — A brittle natural metal used in alloys to strengthen a softer metal. Bleeding — The technical term applied to pieces of silver-plate where the copper base is exposed, especially Old Sheffield, Plate. Bodenrosette (Pewter) — A quality mark usually found on the base of a holloware vessel in Switzerland, Austria-Hungary, Eastern France and Germany. Brass — An alloy of copper and zinc. Bright-cut Engraving — A form of engraving popular towards the end of the 18th century, which burnishes one side of the cut while picking out the silver with a beveled edge on the other side. Britannia Metal — A silver-white alloy composed largely of tin hardened with copper and antimony. Closely akin to pewter, but differing in the higher proportion of tin. The addition of antimony and the omission of lead results in a more silvery appearance than pewter. It often also contains a small quantity of zinc and bismuth. A common proportion is 140 parts of tin, three of copper and ten of antimony. Popular as a base for silver-plating. Britannia Standard — Silver of this standard is 95.8 percent pure, with 4.2 percent alloy. The Britannia standard replaced the sterling standard in England in 1697 and remained in mandatory use there until 1720. Bronze — An alloy consisting chiefly of copper and tin. Burin — A pointed steel cutting tool used in engraving or in cutting stone. Butler’s Finish — Satin finish produced by a revolving wheel of wire which makes many tiny scratches, giving the article a dull appearance. Burnishing — Essentially a polishing process in which the rounded edges and point of a metal blade set in a wooden handle are used to compact and smooth the surface of a formed silver object, or to brighten the dull surface of cast silver. Caryatid — Female figure used as a support, as in architecture, or in a handle. Casting — A method of shaping an object by melting the metal and pouring it into a specially prepared mold. On cooling, the metal retains the shape of the mold. Cast Chasing — An ancient method of producing small parts, such as feet, handles or finials. An exact model of the required part is made in a soft material, from which an impression is taken in two halves, forming a mold when clamped together, into which molten silver can be poured. Chasing — The decoration of silver by the use of punches, removing no silver in the process. Chinoiserie — Decoration in the Chinese style, popular throughout Europe, particularly France: (1) Embossing with Chinese figures in the Dutch style; (2) Linear decoration in flat chasing, exclusive to England, c. 1680-1690 (referred to as Chinoiserie throughout, all else being “in the Chinese style”); (3) Repousse Rococo decoration using Chinese motifs, mainly found on objects concerned with tea, c. 1750. Cloissone — Enameling by melting the frit into areas defined by wire soldered to the surface being decorated. Coin — By 1830, COIN, PURE COIN, DOLLAR, STANDARD, PREMIUM or the letters C or D were used to indicate 900/1000 parts of silver. (Some lesser amounts such as .800 were also considered coin). Copper — One of the true metals, mostly used in an alloy for vessels, but sometimes found lined with tin. C-scroll — Usually applied to the shape of a handle in the form of the letter C; also called “single scroll”. Cut Card Work — Flat sections of very thin silver, cut out to a simple pattern such as foliage, and soldered on to the surface of the object to be decorated. Brass cut card work is sometimes found on pewter steins. Date — The date included in the maker’s mark in many countries either indicates the date of the legislation under which the piece was marked, or it records the date of the master’s entry into a guild. Sometimes, however, succeeding generations of a family continued to use the earlier dates of their ancestor’s admission, as if to say “Established since...”. The date does not show the year in which the piece was made. Pewter was generally not marked with date letters in the same way as silver pieces were marked (Scandinavia is an exception). Dolphin — The sea dolphin used as a sculptured or carved motif. Very popular in Flanders (Belgium) and Denmark. Double-scroll — A sinuous line of S-shape, or composed of reverse curves, used frequently in the design of handles. Drum — The section of the vessel between the lid and the base; the main body of a vessel. Electroplating — The application of a pure silver coating to otherwise finished articles, by the process of electrolysis. Perfected by Elkington Co., c. 1840. Electrotype — A copy of an art object produced by electroplating a wax impression. Used in the nineteenth century to reproduce antique objects. Embossing — Similar to repousse in appearance, but used mainly to create relief designs achieved in one action, such as those impressed by a shaped metal die. Englisch Zinn (Pewter) — Metal purified to English standards, or using English tin. See also “Feinzinn”. Engraving — Line decoration cut by hand into the surface from the front. Used since primitive times, skill and delicacy of touch are of extreme importance. Now often mistakenly called “etching”. EPNS — Electroplate on nickel silver. EPWM — Electroplate on white metal. Etching — Surface decoration bitten-in with acid, producing a different type bite than engraving. 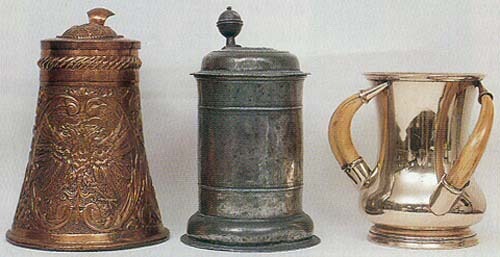 Copper stein, 1700s; pewter stein, early 1700s; silver plated pass cup with bone handles, late 1800s. Faux — Literally false, or fake as in “faux-cut card work around the base.” See also “Apocryphal”. Feinzinn — High quality pewter. Finial — Topmost feature of a piece, or centering the lid of a measure or flagon. Usually cast and often figural. Flat Chasing — Chasing in very low relief worked from the front, pushing the metal aside in line drawing, giving a less sharply defined, but much more positive, outline than engraving. Always visible from the back. Fluting — A surface decoration composed of a series of parallel, usually vertical, concave channels. Derived from classical architecture, fluting was used to ornament the shafts of columns and pilasters. Frit — A mixture of previously made glass ground into a powder and mixed with oxides and oil to give enamel its glass base. Used in a paste form in Cloissone. Fusion — An act or operation of melting, as in the fusion of metals. Usually accomplished by the application of intense heat. Gadrooning — A surface decoration composed of a series of parallel, smooth, rounded ridges juxtaposed vertically, or sometimes set diagonally or in a swirling pattern. In appearance, gadrooning is the opposite of fluting. German Silver — A silver-white alloy consisting principally of copper, zinc and nickel. During World War I, this name was dropped by many in favor of the term nickel silver. Gilding — The application of a gold color to silver either: (1) by melting gold with mercury and painting it onto the surface with a brush, before removing the mercury by evaporation under heat, causing the two metals to fuse; (2) by soaking a linen rag in a solution of chloride of gold, burning it and rubbing the ashes onto the silver, which adhere; or (3) by modem electrolysis. Gold Plating — The covering of an article with gold by electrolysis. Grotesques — Fanciful and intricate designs loosely incorporating human figures, sphinxes, animals, foliage, etc., derived in the 16th century from Roman originals. Hallmark — Used for both silver and pewter vessels. See “Maker’s Mark”. Holloware — A general term for articles in the form of hollow vessels, such as mugs, steins, flagons, ewers, teapots, coffeepots, bowls and pitchers. Housemark — On pewter, a non-heraldic device stamped or engraved to signify ownership. Knop — An abrupt widening in the middle of the stem of a chalice or cup, usually global or egg-shaped. Limoges — Enamel painted on metal, covering the surface. Martele — The French term for “hammered”, used to describe the decorative effect of the honeycomb-patterned facets left on an object by the planishing hammer. This surface was favored in the second half of the nineteenth and early part of the twentieth centuries by silversmiths who wanted to emphasize the impression of handwork. Maker’s Mark — The maker’s touchmark that acknowledges responsibility for his work. Usually in the form of a cartouche bearing initials or name. In English-speaking countries, it is called a Hallmark. See also “Date”. Matting — A decorative effect created by impressing the surface of the silver article with the point of a tool cut with one of a variety of hatched designs or a series of fine dots. The technique is used to break up the shiny surface of an object by providing contrasting matted areas. Nickel Silver — An alloy of nickel, copper and zinc. Niello — A black alloy of silver, copper, lead and sulphur used to fill in engraving, giving an inlaid effect after being fired and polished. Used from early times, especially with Russian vessels. O.E.W.S. — Old English Wine Standard; pre-Imperial capacity, pre-1826. Ormolu — Literally, “ground gold”. Ground gold leaf used as a gilt pigment. Also, brass made to look like gold. Parcel Gilt — An object that has been partially gilded. Patina — Soft luster caused by tiny scratches and oxidation that come with daily use and age. Pewter — An alloy of tin and copper or any alloy of the low-melting-point metals, including tin, lead, bismuth and antimony. The higher the tin content and the lower the lead content, the better the pewter. Pierced Work — see “Ajoure”. Pit Marks — Minute holes usually found on pewter, lead or other soft metal borders (edges). Plate — Used in England and on the Continent when referring to articles made of precious metals. Used in the United States to mean electro-silverplate. Pricking — Tiny dots struck in the surface of a vessel to give detail to an engraved pattern or to render dates, initials and occasionally coats of arms and longer inscriptions. Pseudo Hallmarks — Devices used to suggest English hallmarks, but never registered. Quality Marks (Pewter) — Several of the marks which indicated the quality of the pewter in the vessel. These included the Rose and Crown, the Angel Mark, an X sometimes crowned, and others, depending on the country (see “Bodenrosette”) and the decade. All quite confusing but an interesting field of study. Repousse — A method of making patterns or pictures in relief by pushing out the surface of the metal from behind. Rolled Plate (R.P.) — See “Sheffield Plate”. Sheffield Plate — True Sheffield Plate was produced by fusing, with intense heat, a thin sheet of silver to one or both sides of a thick sheet of copper. The composite metal was then rolled down to the proper thickness for fabrication. Invented by Thomas Boulsover about 1743, it was rampant by the 1760s throughout England and Europe. Most frequently called Old “Sheffield Plate” to distinguish it from electroplate. Silverplate — A base metal, usually either Britannia, nickel silver or copper, coated with a layer of pure silver by electroplating. Skirt Base — Chiefly on flagons and tankards, flaring outward to raise the body from table level. Soldering — The method by which separately-made silver parts are joined together, using an alloy that will melt at a lower temperature than silver, thereby melting when applied to hot silver during soldering. A hard alloy of silver and zinc is now generally used. Spinning — The production of hollow wares on a spinning lathe by means of forcing a disc of rotating silver, Britannia or other metal up around a previously hand-turned hardwood head, with a long-handled steel-headed tool, until it has taken its likeness. Known since ancient times, but popular since the early 19th century. Used in later Old Sheffield Plate vessels which are seamless. Stamping — The mechanical production (since c. 1820) of ready-made parts in quantity, complete with their decoration, by the use of hard steel dies cut in reverse to the required pattern. Stamped borders, strapwork, etc., used from the 16th century, were hand-hammered from the back, also using hand-cut dies. Sterling Silver — 925/1000 fine, with 75/1000 of added metal, usually copper, to give it strength and stiffness. This is the standard set by the United States Government in the Stamping Act of 1906, and any article stamped “sterling” is supposed to be of assured quality. Touchmark — an impressed mark; see “Maker’s Mark”. Town Mark — The mark assigned to a city and applied as a quasi-hallmark to denote the location of manufacture, usually a coat of arms, devise or seal of the city. Tulip-shape — Baluster-shaped; usually applied to the shape of English mugs and tankards of the 1700s and 1800s. Verification Marks (Pewter) — Found on both British and French vessels. The stamped marks indicate the vessel(s) so stamped hold(s) the amount of liquid marked on the vessel; e.g., “pint”. Vermeil — Gold-plating process developed in France in the mid-1700s. France banned production of vermeil early in the 19th century because the process involved the use of mercury. Present-day vermeil is produced by a safe electrolytic process. White Metal — An alloy usually containing two or more of the following elements: tin, copper, lead, antimony and bismuth. The color depends on whether lead or tin predominates. The more tin the whiter the color. Wrigglework — Zigzag engraving, achieved by moving the burin in a rocking movement; or a roulette, or wheel, with a finely-crimped edge. Popular in the late 17th and first half of the 18th centuries, especially on pewter. *Reprinted from The Beer Stein Journal, February 1995, by permission from Gary Kirsner Auctions.